Justin Lawson is a registered Adventure Guide (Tourist Guide Registration number: WC 7055). He holds a First Aid Certification and is fully insured for operating as a climbing/abseil guide. Justin has been climbing for 28 years. He was first introduced to climbing by a friend from Scouts when he was 11 years old. (His mom will tell you he started at age 3). From 2000 – 2005, Justin & his wife Riki moved to London to work in the then booming IT industry. Justin worked as a Microsoft & Cisco network engineer in the banking sector and Riki as a software developer. Whilst living in London, they dreamed of one day owning a house and settling in Montagu, South Africa. From early beginnings, Climb ZA now South Africa’s best and most popular climbing website hosting South Africa’s largest Rock Climbing Community Forum, photo gallery and routes database. It is packed with useful and current information that provides the latest local/international news and articles for climbers, as well as mountain related outdoor activities such as bouldering, mountaineering, kloofing, base-jumping, slack-lining, hiking, scrambling & camping. Climb ZA is the first destination of climbers planning a trip to South Africa. Justin is responsible for the great content and ongoing success Climb ZA (www.climbing.co.za) which receives in excess 150,000 pageviews a month. He has been a proud member of the Mountain Club of South Africa since 1997. He has climbed at many destinations around South Africa, the USA, the UK, Austria, Italy and Thailand. He is respected gear reviewer for local and international climbing brands such as Petzl, First Ascent, and Cape Union Mart. He has worked as stuntman, rigger for movies, television & print commercials. He is a published climbing photographer. He has experience in all aspects of climbing – trad, sport boulder, multi pitch, big walls. He has acted as an advisor on the Montagu Mountain Reserve Committee. 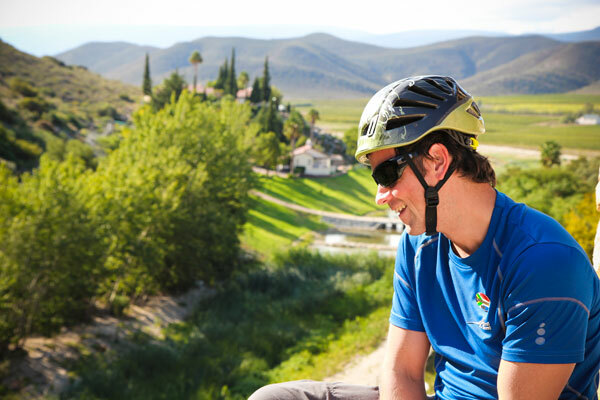 He has played a significant role in the development (bolting) of new climbing areas in Montagu such as the Bold & Beautiful crag as well as the upkeep of existing routes. Justin divides his time between his family, the running of Climb ZA, and rock climbing. He looks forward to getting his clients into the mountains.